Till early 1920s, opportunities for quality legal education in India were limited. It is not uncommon to see Indian legal luminaries from the era with an Oxbridge law degree and enrolment at an Inn of Court. Though reputed colleges like Government Law College, Mumbai were in existence since later half of the 19th century, the founding of faculty of law on Delhi University, ILS Law College in Pune and a host of other colleges in various states and universities across the country made quality legal education accessible. The Bar Council of India kick-started the next level of evolution in legal education in the country through the founding of National Law School of India University. The establishment of this premier law school in Bengaluru has brought about a paradigm shift in teaching of, and research in law. The Bar Council of India visits and inspects Universities/Law colleges in the country as part of its statutory function of promoting legal education and laying down standards in consultation with the Universities in India and the State Bar Councils. 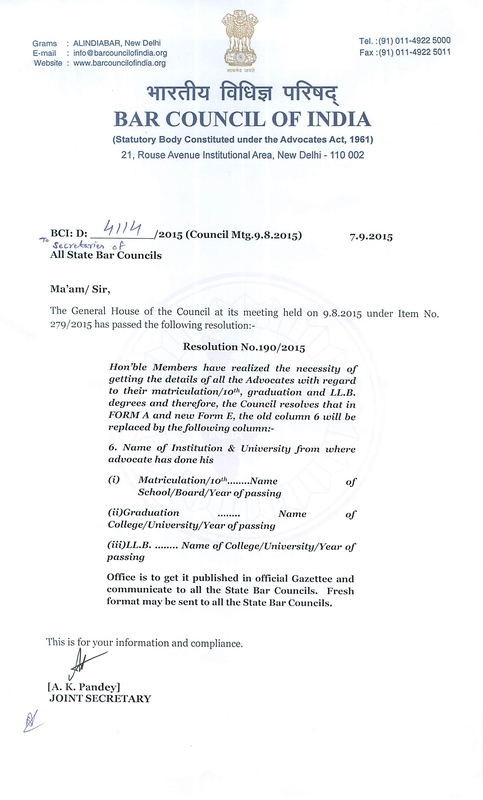 Click here to read the Bar Council of India’s Inspection Manual for 2010. 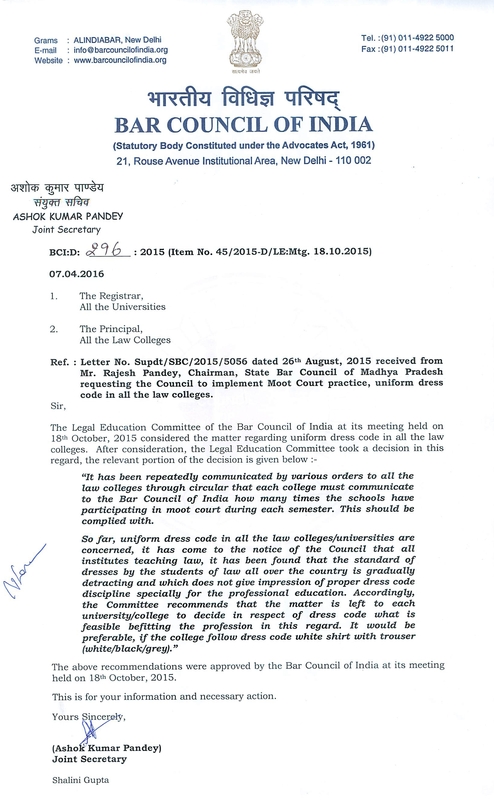 Click here to see the Bar Council of India Education Rules, 2008. Click here for New Law College Application Form. 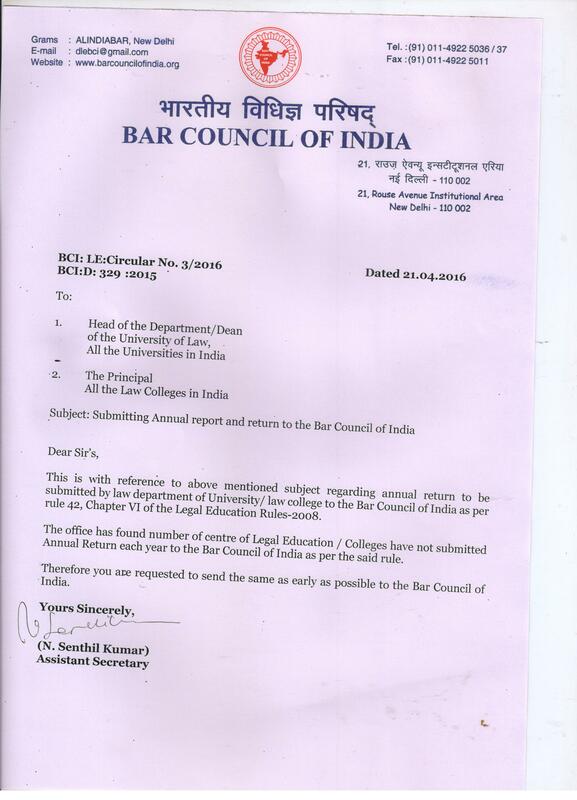 The Legal Education Committee at its meeting held on 30th April, 2010 recommended that all the law colleges having deemed/ permanent status will be inspected by the Bar Council of India and also directed the colleges to deposit inspection fee for permanent/ deemed courses. Therefore all the deemed/permanent status law colleges are required to deposit inspection fee for Rs. 1,50,000/- for each course alongwith application and check proforma by way of Demand Draft drawn in favour of the “Bar Council of India” on any Nationalized Bank payable at New Delhi. The Legal Education Committee at its meeting held on 16th & 17th April, 2011 has decided to increase the inspection fee from Rs. 1,00,000/- to Rs. 1,50,000/- for each course. 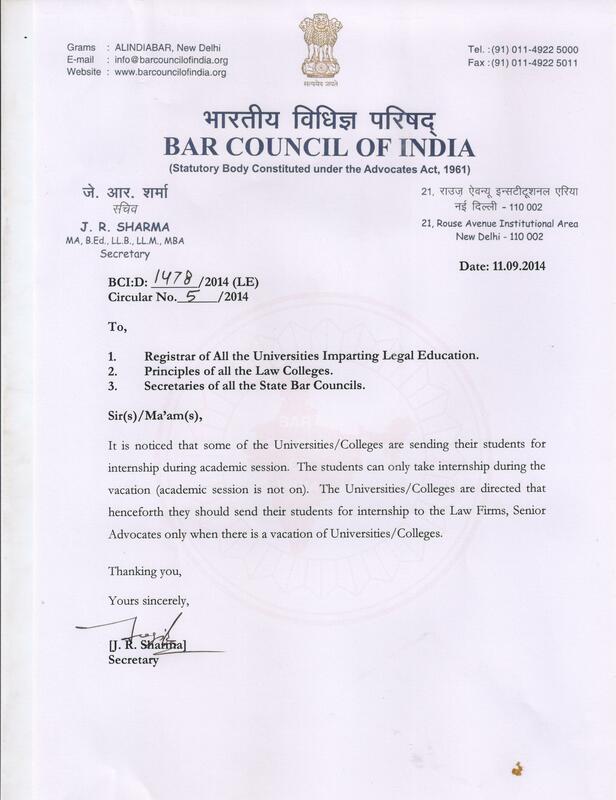 Therefore all the law colleges are informed to deposit Rs. 1,50,000/- for each course alongwith application and check proforma by way of Demand Draft drawn in favour of the “Bar Council of India” on any Nationalized Bank payable at New Delhi. AS PER THE DECISION OF THE LEGAL EDUCATION COMMITTEE MEETING HELD ON 21ST MAY, 2016 THE FOLLOWING FEE STRUCTURE HAS BEEN INTRODUCED. LE Circular No. 1 of 2018 Regarding online attendance system. LE Circular No. 2 of 2018 Regarding Grant of affiliation order to the Centre of Legal Education/Law Institutions imparting legal education. LE Circular No. 3 of 2018 Regarding Translated version of affiliation order of the University. Minutes of the Meeting of University Grants Commission (UGC), Bar Council of India (BCI), Ministry of Human Resource Development (MHRD) and Association of Indian Universities (AIU) regarding equivalence candidate for LL.M. degree perused from foreign Universities.